The urban area of Akola is growing steadily in recent times. As such there has been a gradual improvement in the administration of Akola. It has evolved from a Taluk level administration to a fully functional Municipal Corporation. The population of Akola City as per the 2011 Census is 427,146. This figure includes the urban area as well as the surrounding areas of Malkapur and Khadki. The literacy rate of the city is at an impressive percentage of 91.34. 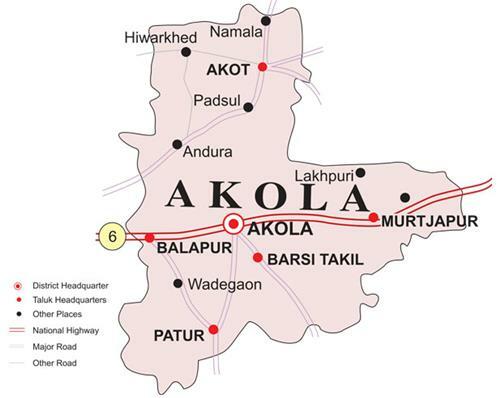 Akola city has a division of 73 electoral wards and has four different zones. The Akola Municipal Corporation, established in 2001, is the principal body responsible for the administration in the city. Some of its responsibilities include administering public services, infrastructure development, and the police. The head of this entity is the Mayor and the Municipal Commissioner. The Deputy Mayor is a key individual who assists in the implementation of administrative tasks, policies and procedures. The members of Akola Municipal Corporation are elected democratically. Several members of the leading political parties of Akola hold offices within the corporation. The current mayor of Akola is Mrs Jyothsana Gawai and the Municipal Commissioner, Mr Deepak Chaudhary. Administratively Akola district falls under the purview of the Divisional Commissioner of Nagpur, who also maintains jurisdictions over several other districts. Similar to most administrations the Revenue department of Akola rests with the Collector’s Office who shall, should the need arise, monitor other departments as well. This office also consists of Prant Officers who act as Assistant Collectors, and District Deputy Collectors who form part of the Maharashtra Civil Service. The Municipal Corporation delegates tasks to various committees within Akola namely the Education Committee, Women and Child Welfare, City Development Committee, Law Committee, and the Standing Committee. Some of the vital sections of the administration also include the Labour Department, Prohibition and Excise Department, Charity Commissioner, Social Welfare and Managed Estates. Each of these committees has a specific target and deadlines to meet. Therefore they function like a single unit cohesively, keeping in mind the best interests of the district. The official public transport of Akola is known as AMT, Akola Municipal Transport. The State Road Transport Corporation has recently improved the condition of the roads in the region, thus enabling better transport facilities to the rural areas. The Judicial body functions separately from the Executive Body. Similar to other judicial bodies in India, the District and Sessions Judge heads the Judicial department, who works with the assistance of an Assistant Sessions Judge. The District and Sessions Judge presides over criminal and civil cases. In addition to these departments are there some locally autonomous statutory bodies within Akola district namely the Town Planning & Valuation Department, Zilla Parishad, Village Panchayats, and Panchayat Samitis. Akola is growing steadily in recent times due to the advancements in medical facilities and the slow and steady growth of Information Technology in the region generally. With increasing needs of urban infrastructure and the steady inflow of population from the nearby Taluks, the administration of the district will expand gradually.